When I’m stressed, I hit the nicotine. I’ve never been a smoker since my lungs can’t stand it. I’ve also used snus on occation but the potential mouth/tooth rot potential for it scares me. 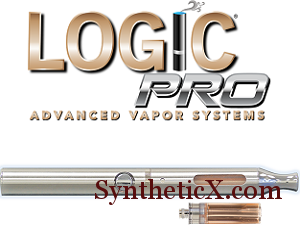 I won’t say vaporizing is harmless, as cigarettes were harmless for a long long time. Perhaps sometime in the future we’ll find all the propolol-glycol we were putting into our lungs had a hidden impact. Out of all the ways to get a bit of calm-down in the day I feel it’s one of the least harmful. <- quoted for posterity, right there. 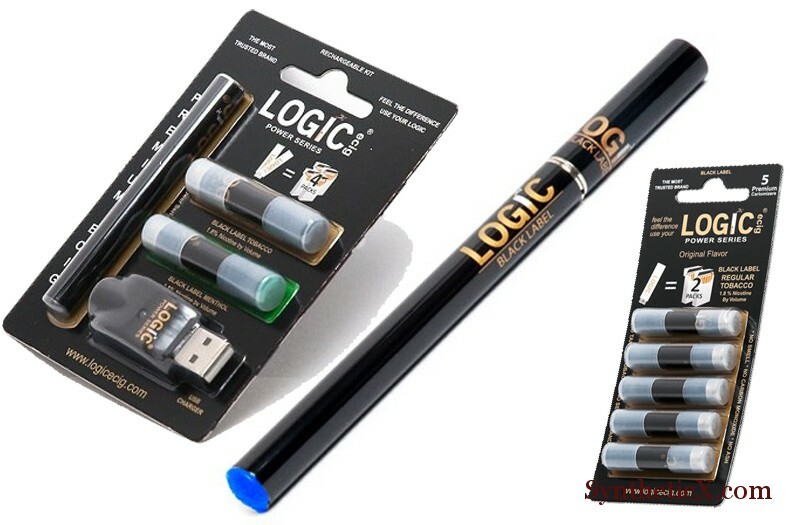 I’ve been using logic power series since I tried their throw-away at least 3 years ago or so. Of course when it was done I ripped it apart to see how it was made. It felt like a cigarette, could be used like a cigarette, held the same, stowed much more safely and once I got the rechargeable one it seemed like a good bet. I went through a time way back when I was using them all the time. The area of my car was littered with spent cartridges in much the same way Tom Cruise has his desk littered with spent inhalers in Minority Report. Now a days it’s few and far-between but it’s helpful to move on with my life when I feel like everything is going to fall apart and is an excellent alternative to tearing all the nail and skin from my fingertips! In case you’re not familiar, the power normally comes with a battery (3″), charger (1″) and two cartridges (1″) to start. The battery screws onto the charger, and it plugs into a usb to recharge, which takes about 2 hours. The cartridges used to come in 5 packs for about $20. If you smoked it constantly you could get about a day out of a single one. That’s a lot of nicotine in a day, especially if they were the + which has 1.8% nicotine over the usual 1%. The power retails for $19.99 with the charger and 2 carts, so you’re spending about $10 on the unit itself. Lately I can’t even find the 5 packs of carts, it’s only 3 for $11 – not horrible, but you trade having to plop down a whole $20 for paying slightly more. Given the convenience, it’s a nice to have. The Pro is relatively new. It retails for $24.99 with charger and I got 5 carts with it. It’s a sampler; 2 regular tobacco, 1 regular menthol, a 1.8% tobacco and 1.8% menthol come in the package. It’s significantly bigger and the carts are almost little vials. You can easily see all the “juice” though I hate calling it that, oil sounds worse. Inside the power series carts you’ll find soaked synthetic fiber. It looks like cotton, pulls apart like plastic but is strictly a vessel for holding the liquid without having it spill all over. When it is heated, the vapor leaves the material. If you leave it out for too long, or when it’s used all the material inside will be dry. There is a definite advantage in the carts for the pro, they seem more efficient, look to contain more and address one of the flaws of the power series – you know when you’re out. You can never quite be sure with the soaked material as you can leave it, it will condense a little and you might get an extra drag or two before the death puff. Remember that cotton like material? Really bad when it heats up without any liquid in it. It’s like sucking burnt hair into your lungs. I learned long ago I’d rather lose the last few drags than to take the chance on the death puff. I’ve only used the pro for a day or so now, and though there are some advantages, I don’t think it’s for me. It’s a nice solid aluminum so it’s not overly heavy, but it’s big. With the svelte size of the power, the pro feels like a bong. It hits like one too. You get an unrestricted plume of vapor, which you know is both welcome and dangerous. I also don’t think I could get away with it at my desk. Not only am I more apt to take a huge drag, it’s also less discrete. The power series is black and the size of a pen. It could easily be mistaken for a pen when the blue light at the end isn’t on, being actively dragged. I don’t get any flack currently, but this things just too much. I like the idea, but it needs to be smaller. Get these design of carts into the size and design of the power and I’m hooked.